Recent efforts have focused on replacement of the train’s resistor grids, enabling a return to operation. 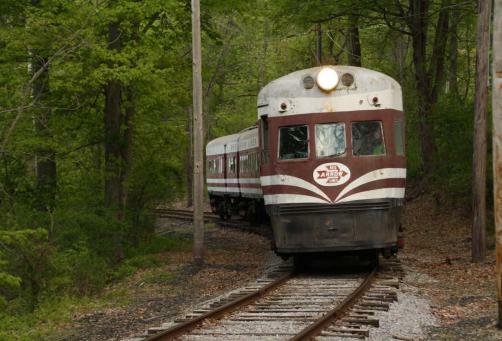 The train is always popular with visitors and looks right at home in the rolling Pennsylvania landscape. The train returned to operation in February at an annual gathering of volunteers from a number of electric railway museums. Donations of any amount will help us complete these goals. Your help is essential and most appreciated! Railways To Yesterday, Inc. fully endorses the goal of the Illinois Railway Museum to restore sister train 801-802. The organization feels strongly that preservation is best served with a restored example of each of these trains; one in Illinois in its CNS&M configuration, and one in Pennsylvania in its Liberty Liner configuration. Railways To Yesterday, Inc. is a 501 (c)(3) non-profit corporation. Donations are tax deductible to the extent provided by law. For more information, please consult your tax advisor.